AS an Australian, touching down in New Zealand can feel familiar. There’s no language barrier, no culture shock and the currency conversion is easy to get your head around. But peek beneath the surface and you will see this little country is a big adventure waiting to happen. Jasmine O’Donoghue hops from one escapade to the next on the magnificent North Island. Most North Island adventures will begin in the major airline hub of Auckland. Only a short flight from Australia’s East Coast, it’s is the perfect base to start or end a trip. The city offers all the luxuries of a buzzing metropolis, but is situated only half an hour from breathtaking natural landscapes. A short ferry ride from Auckland lies the vineyard-clad Waiheke Island. The culinary and wine connoisseurs’ paradise feels a world away from city life and offers a haven of wineries, olive groves, restaurants, cafs and boutiques. It’s an experience which is best savoured, so take your time, kick back and enjoy a long lunch. In between sips and bites, there’s plenty of opportunities to follow the scenic island’s trails, which loop along the many cliff tops, along beaches and through the native forest. The thriving marine playground of the Bay of Islands is known for its water activities and postcard-perfect beauty. Getting from Auckland to the Bay of Islands is an experience in itself. The windy roads of the Twin Coast Discovery Highway wrap around farmland and mountain ranges, weaving their way to the shore. Take your time to savour the stunning beaches, quaint towns and attractions along the way. Paihia serves as a great base to explore the islands, with cruises leaving daily from the town. A day exploring the islands can be as active, or relaxing as you choose. Spot dolphins, get close with giant volcanic rocks, dive in for some boom netting, hike to the top of a hill or just sit back and marvel at the views. Heading back towards Auckland, the route is dotted with cosy beach towns. Just one night in the lazy little village of Piha will leave you wanting more. Wedged between rugged mountains and a dramatic black sand beach, nearly every stretch of this town boasts spectacular views. In the late afternoon, watch as the mountains melt into a gentle fog and the final glimpses of daylight bounce pink rays off the black sand. New Zealand is famous for its network of glow worm caves and Waitomo Caves will not disappoint. Driving into the town you wouldn’t believe what lies below. Take a boat tour and glide through the caves, illuminated by these marvellous creatures or take a walking tour and marvel at the history and science of the grand formations along the way. Dial up the adrenalin and jump in the river for Black Water Rafting, which will see you abseil, weave, climb and jump off waterfalls — sometimes backwards into complete darkness. Rotorua is the adventure capital of New Zealand. From the rush of rolling down a mountain in a giant inflatable ball at Ogo Rotorua (pictured centre), to splashing your way along thundering rapids, it’s hard not to be thrilled by this city. Rotorua is one of the world’s most lively geothermal areas and it hosts a unique blend of Maori culture and natural wonders. Head to Te Puia and explore the Geothermal Valley of Te Whakarewarewa, home to the Southern Hemisphere’s largest active geyser. The night experience provides a deeper insight into the Maori culture and includes a traditional welcome, a cultural performance and a traditional Hangi feast. The evening culminates with an invitation to revisit the geothermal valley and curl up on heated rocks and wait for the geysers to erupt. For a birds-eye view of the city, take a gondola up the side of Mount Ngongotaha to Skyline Rotorua. Tuck into a meal, zip along the luge tracks, mountain bike or just take in the scenery. 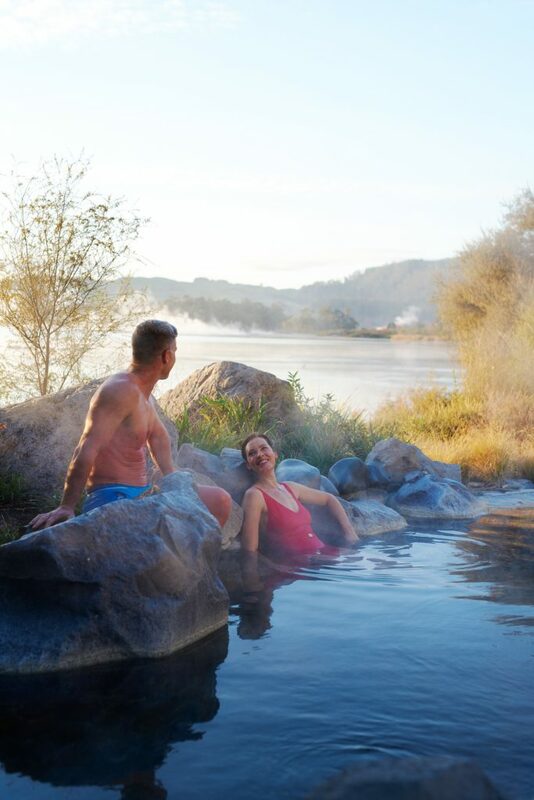 Don’t leave Rotorua without indulging in The Polynesian Spa. The retreat hosts 28 hot pools, including slightly acidic waters to relieve tired muscles and alkaline pools to nourish skin. Complete the experience with a geothermal mud body wrap at the Retreat Day Spa. On your way to Lake Taupo, dedicate an hour or two at Orakei Korako Cave and Thermal Park. Known as “the Hidden Valley”, the geothermal wonderland features bubbling mud pools, hissing geysers and steaming hot springs. 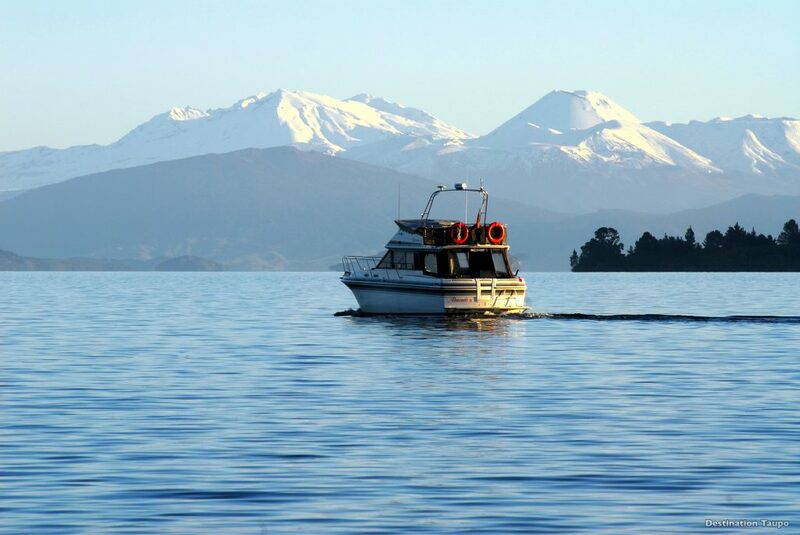 Lake Taupo is New Zealand’s largest lake and is a popular holiday destination for locals. The tranquil lake has a turbulent history, and was formed in 186 AD by a series of nine volcanic eruptions — the most violent eruption ever recorded. Today the region is a laid-back mountain biking destination. Refuel at the strip of eateries perched on the edge of the lake, sail trip to the Maori Rock Carvings or jet boat ride to the mighty Huka Falls. The coastal town of Napier is another destination where locals head for a break, with the city providing all the charms of a wine region, partnered with beautifully preserved 1920s architecture. The architecture can be attributed to the rebuilding efforts following a massive earthquake in 1931. At a time when the Great Depression saw construction in many parts of the world grind to a halt, Napier began rebuilding, and the vast majority of construction was done in the art deco style. Today the town is one of the most revered art deco cities in the world and has a truly unique character.